USA - The National Theatre of Bahrain is the top winner of USITT’s 2015 Architecture Awards for exceptional performance spaces, while new performing arts buildings at theatre schools in London and Portland, Oregon, also will be recognized in 2015. USITT, the United States Institute for Theatre Technology, selected the Bahrain National Theatre for its top architecture award, the Honor Award, in 2015. 2015 Merit Awards will go to Milton Court, the performing arts building at the Guildhall School of Music in London, UK, and the Performing Arts Building at Reed College in Portland, OR. USITT’s Architecture Commission will present the awards at USITT’s Annual Conference & Stage Expo March 18-21 in Cincinnati. USITT 2015 also will offer more than a dozen architecture sessions, several carrying AIA/CES credit. USITT annually recognizes the best contemporary performance spaces built or renovated in recent years with Honor or Merit awards. 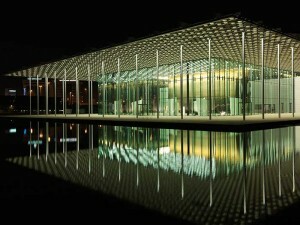 The Bahrain National Theatre was designed by AS.Architecture-Studio in Paris, France, with Theatre Projects Consultants of London. It is a $50 million work of art occupying 12,000 square meters on the Lagoon in capital city Manama’s commercial district. 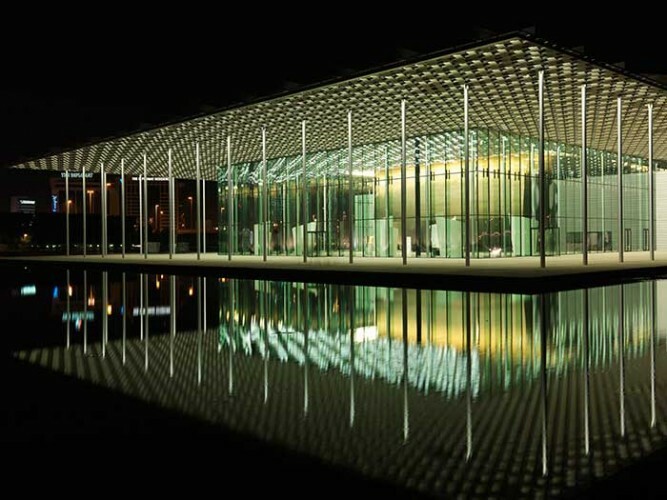 The building’s "extreme horizontality" in shimmering glass and aluminum reflect the Persian Gulf archipelago, while its canopy of open-weave aluminum evokes the country’s traditional wicker roofs, the architects wrote. Inside, the curving, elm-paneled walls of the performance hall resemble the inverted hull of a ship, a tribute to the region’s ancestral pearl-fishing boats. The main hall has an Italian theatre layout, with long side balconies and two tiers of rear balconies. Theatre Projects Consultants also worked on Merit winner Milton Court, a $142 million project designed by RHWL Architects of London. 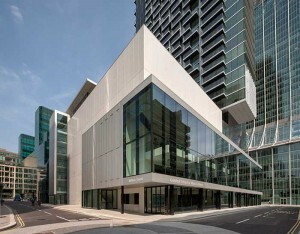 The building, which opened in September 2013, provides new performance and teaching spaces for the Guildhall School of Music and Drama. It includes a concert hall of up to 608 seats, a theatre of up to 227 seats, and a 128-seat studio theatre. Merit award winner Reed College’s new $28 million Performing Arts Building consolidated theatre, dance, and music programs formerly spread across the college’s 128-acre campus into one 80,000-square-foot building, designed by Opsis Architecture of Portland with consulting by Fisher Dachs Associates of New York City. USITT's Architecture Awards are chosen based on creativity, contextual resonance, functional operation, use of new technology, and community contribution. Each project will be represented in a special exhibit at USITT 2015, with an awards reception in their honor.